I’ve always been a sucker for a delicious grilled cheese sandwich. 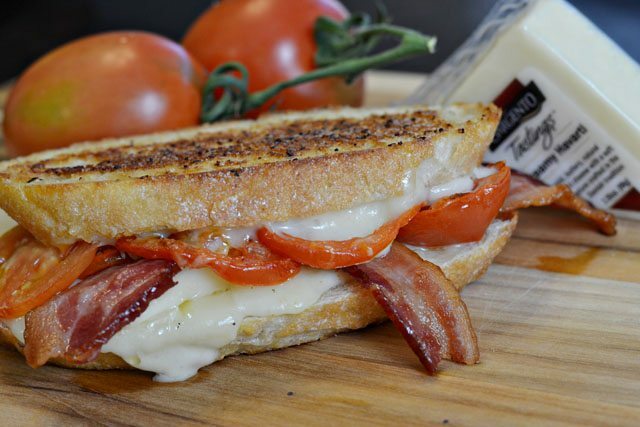 After all, how can you go wrong with OOEY GOOEY CHEESE, bacon, roasted tomatoes, and crusty garlic bread?! I can tell you’re salivating just thinking about the cheesy goodness so let’s just get on with, shall we? Directions: Preheat your oven to 425 degrees Fahrenheit. 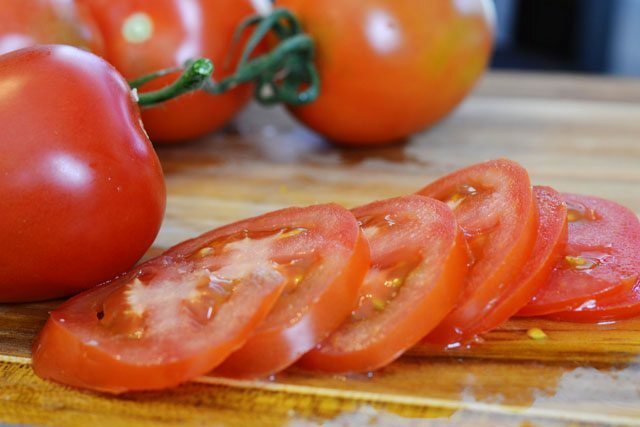 Slice your vine-ripened tomatoes. 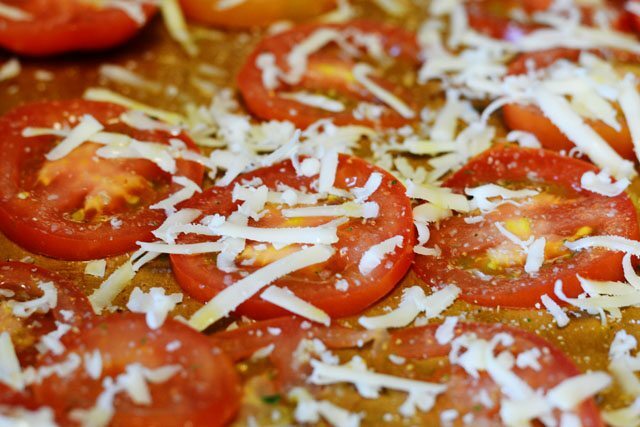 Spread your tomatoes out on a cookie sheet, sprinkle with Medium Asiago cheese, and a little garlic powder, bake for 10-15 minutes, or until the cheese is melted and the tomatoes are bubbling. I cooked my bacon in the oven with the tomatoes, it’s easier and less messy that way, but you can do whatever your little heart desires. When your bacon and tomatoes are done, heat a heavy skillet or pan over medium-high heat. Spread butter on one side of your bread and sprinkle with garlic powder. Place buttered side down in hot skillet, and immediately top with Creamy Havarti cheese. Be generous my friends, you won’t regret it. Top cheese with 3 slices of bacon and sliced tomatoes and cover for a few minutes until the Creamy Havarti starts to melt. Remove lid and sandwich the bread together, continue cooking until the bread is golden brown and crunchy! Mmm, the gooey cheese is calling my name. So delicious! ooey gooey goodness! I put sliced tomatoes on my grilled cheese sandwiches too (hubby gets real cheese I get rice cheese) . Yours looks so delicious!!! I love gourmet grilled cheese sandwiches! This looks so yummy (havarti cheese…yummmm)! Oh my gosh…this sandwich looks absolutely amazing. I love the bacon added to it plus the two kinds of cheese! HO-LY yum. Thanks for including this on #TwinklyTuesday. Yum! I pinned for later. Thank you for stopping by Pin Worthy Wednesday! You had me at bacon, lol. Thank you so much for linking up with Thursday Favorite Things. I love your header!! wowee…. And love the sandwich, too. Featuring. I can't wait to try this!! Thanks for sharing on My 2 Favorite Things on Thursday!! Hope you come back tomorrow!! Pinned!! This is my kind of sandwich!! Can't wait to try it! Thanks for sharing it with us at #FoodieFriDIY! Sending some foodie love your way! I'm DYING. All my favorite things in one sandwich. I love the idea of garlic bread! If I hadn't just eaten dinner I'd be making one right now. Wow, this sounds delicious! I'm gonna pick up some fresh tomatoes at the farmer's market this weekend and try it. By the way, I'd love to have you post on my new blog hop (open all weekend) at http://www.myflagstaffhome.com, if you're interested. This sandwich is amazing:-) I cook bacon in the oven too. I think it keeps more of its flavor. Thanks for linking up and sharing with us at Funtastic Friday. Hope you join us again this week. I am going to have to try to make this for lunch this weekend! It looks so yummy! Hubby is not a big fan of Havarti cheese. do you think pepper jack would be okay in its place?